So I know your asking yourself, what do PB&J and jewelry have in common? If you have seen the Blue Moon Bead/Blue Sky Tin dessert then you may have an idea. The Blue Moon Bead tin mixes are so cool. Names like Sour Grapes, Toffee Crunch, Rum Raisin, PB&J and Mud Pie will make some delicious pieces of jewelry. For this necklace and earrings I chose the PB&J and Mud Pie mixes. Love the cool blue and grape colors and mixing in the look of metal with the Mud Pie mix turned out to be the perfect combination. 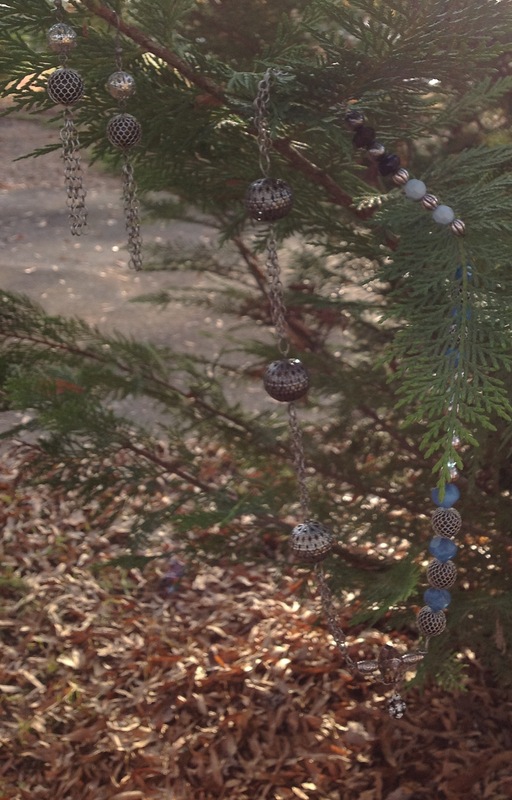 Using three large Mud Pie Beads, add eye pins, attach three pieces of chain to each bead to connect them. Using beading wire, string the beads in desired pattern, crimping both ends and make sure to add a jump rings, attach to the chain pieces on one end. Then add a clasp to each end. I also took an eye pin, two tube beads and a large crystal, draped chain and added a focal pendant. For the earrings, use eye pins for each bead., connect them together, add your ear wire. I love movement in my earrings so I added three lengths of chain to each earring for playfulness. Enjoy making this set, maybe mix it up using any one or two of the Blue Moon Bead Tin Mixes. This entry was posted in art, blog, crafts, creative, handcrafted, handmade, jewelry. Bookmark the permalink. ← Welcome to my first blog! Hey Debbie. Just catching up on my blog reading. Lovely to see a fellow BMB DT’s take on the same products – it’s so inspiring.